Non-power grass sites- you have plenty of choice when it comes to where you camp. Riverside sites as well as sheltered camping under trees is available. Non-power grass sites. Over 100 sites available so you have plenty of choice when it comes to where you camp. 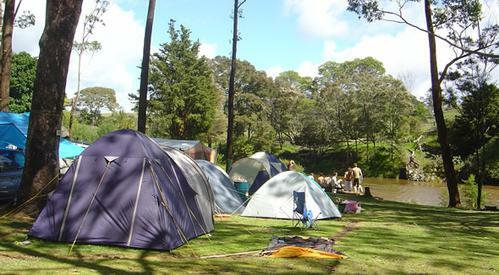 Riverside and sheltered camping under trees is available. We have young people on site for 5 nights. From the 28th Dec to 2nd Jan. The park has been running this event for many years. Come and join the fun. Camping with your friends and heaps of other young people, fill in the form and send back with your deposit. It’s that easy.This event is suitable for young people from the age of 18 to 24 years (preferred). There is a 5 night minimum stay over the New Yearperiod.The price per person is $60 per night, total of $300 for 5 nights. Hard sites and grass sites available for campervans and caravans - some with river views. Sites available close to playground and swimming pool. Secluded sites also available. Each cabin consists of a double bed, and 2 single beds and 2 bunk beds. Linen includes bottom sheet, pillow and pillow case. Extra bedding can be hired at $8 per bed. Each cabin consists of a double bed, and 2 single beds and 2 bunk beds. Linen includes bottom sheet, pillow & pillow case. Extra bedding can be hired at $8 per person. Self-contained (motel style) accommodation with kitchenette. This room features one Double bed and 1 Single bunk set. Linen included. Some units have a deck overlooking playground and park. Freeview TV available. Please note that pets are not permitted in this room type. Fully self-contained (motel style) accommodation. Linen included. Some with large deck overlooking playground and park. One unit with garden view can sleep up to 5. Sorry no pets in tourist flats. Self-contained (motel style) accommodation with kitchenette. The room features one Double bed, and one bunk set (Double + Single). Linen included. Some studios have a deck overlooking playground and park. Freeview TV available. Please note that pets are not permitted in this room type. Contains Queen bed, 1 bunk set (Double + Single) and a sofa bed in the lounge. Features include a fully-equipped kitchen, separate living room, Freeview TV, Wi-Fi and a large deck overlooking the Waitangi River. Linen is included. Please note that pets are not permitted in this room type. Contains Queen bed in main bedroom, 2 x single beds in second bedroom, and 1 x single bed in the lounge. There is room to add a rollaway bed for a 6th guest in the lounge if required (additional charge). Bathroom with shower, separate toilet, full kitchen facilities, lounge, Freeview TV, WiFi. Sited below the main residence, this tourist flat has its own private courtyard. All Linen included. Please note that pets are not permitted in this room type. Bay of Islands Holiday Park is a 4.2 hectare park and is well located for exploring the Bay of Islands. Plenty of trees for shade and the Waitangi River running along one boundary for safe swimming and kayaking. Free car parking and bicycle parking. Bay of Islands Holiday Park is well located for exploring the best that the Bay of Islands has on offer. Centrally located 10 minutes drive from both Paihia and Kerikeri you can enjoy the best of both worlds. We offer a free tour booking service. Tours that pick-up from the park include: Cruise the Bay of Islands, Swim with the Dolphins, charter a yacht, day trips to Cape Reinga and 90 Mile Beach. Drive towards Waitangi along the waterfront until you reach a roundabout at Puketona Road. Turn left into Puketona Road and continue for 7 minutes. We are located on the right side of the road after the Haruru Falls. Drive south until Puketona Junction and follow the signs towards Paihia (Puketona Road). We are located on the left side of the road about 5 minutes after Puketona Junction. Drive through Kawakawa town towards Kerikeri. At Puketona Junction turn right down Puketona Road in the direction of Paihia. We are located on the left side of the road about 5 minutes after Puketona Junction. (The Bay of Islands are 3.5 hours north of Auckland). 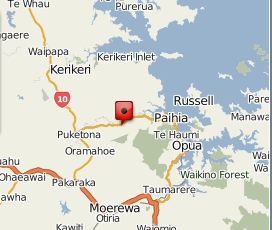 Drive along State Highway 10 in the direction of Kerikeri/Paihia. At the Kerikeri roundabout continue straight ahead until Puketona Junction and follow the signs towards Paihia (Puketona Road). We are located on the left side of the road about 5 minutes after Puketona Junction. Is there any extra information your property requires? I agree to pay one night as a deposit to confirm the booking. I agree to pay a cancellation fee of 1 night room charge to Bay of Islands Holiday Park if I cancel with less than 30 days (i.e 720 hours) notification from my check-in date. All cancellation within 48 hours of check in date (2 pm) will be non refundable. All New Years confirmed 5 day bookings which Cancel will incur a $85 cancellation fee per person. VIP Membership Card Holders must book directly with the Bay of Islands Holiday Park or book on line with Kiwi Holiday Parks to receive the 10% Discount. Please Call or Email the Park to Book.